Enjoy the assortment of boat trips that are offered in Gran Canaria all year round. Experience the coast, the marine life, and the depths of Puerto de Mogan, be amazed at the sight of dolphins and whales, or simply enjoy a boat tour in order to explore other areas and beaches along the southeast coast of Gran Canaria. Choose the boat trips and tours that best fit your interests. 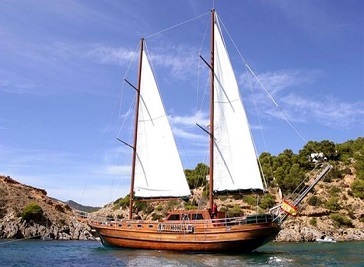 You can choose to sail on a yachting boat with masts. Or in a catamaran. Or perhaps you’d prefer a mini-cruise around the island. You could also sign up for some of the sea parties put on by several of these leisure boat operators. Boat trips to travel the southern coast of Gran Canaria from Arguinequín to Puerto de Mogán, making stops in Puerto Rico and Anfi. 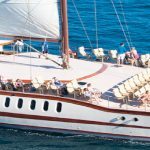 The Aphrodite is the 27-metre sailing boat (a Turkish gulet, to be precise), and is a much more laid back way of taking in the scenery of Gran Canaria’s waters. 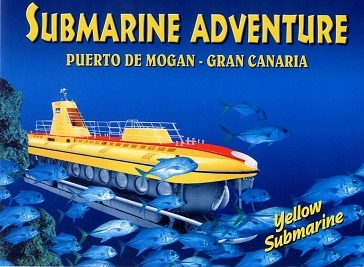 Enjoy a unique submarine tour to the bottom of the sea on board of our Yellow Submarine. Experience a 45 minutes sea adventure in more than 20 meters of depth. Feel the silence of the sea comfortably seated and observe the sea world through big portholes or via TV monitors, connected to video cameras outside the submarine. 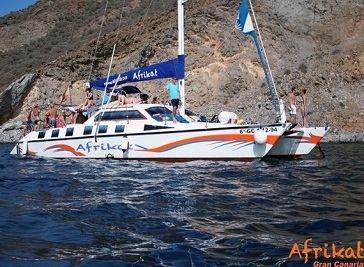 Afrikat Catamaran – the ultimate catamaran adventure – based in Puerto Rico, Gran Canaria, is an amazing way to spend time on the Atlantic Ocean.